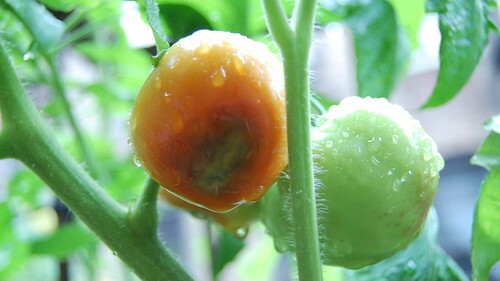 I think my tomatoes are developing blossom end rot. Like this post? Become a fan of gezellig-girl.com on Facebook! Veggie Gardening Tips suggests it is temporary and may be self-correcting: “ensure that your growing beds contain plenty of organic matter to help maintain even moisture levels”. North Carolina State Univ. has very explicit instructions on how to remedy this, and Univ. of Georgia weighs in too. You need to add calcium to your soil, that’s all! Crushed egg shells, not whole milk. You can run them through a grinder, then to make it a touch faster, boil them with a splash of white vinegar to pull out the calcium. Let everything cool, then use the water to lightly water the plants, and bury the finely ground (or crushed) shells in the soil. Good to know. I’ll go check my waiting-to-be-composted stuff and see if there are eggshells in there. Spreading lime around the plants will work as well.